Can you learn from the errors of others? Here is a collection of problems, mostly very simple ones, that gave a variety of players, mostly "intermediate" but including occasional beginners and experts, some trouble. You won't find bidding problems worthy of the Master Solvers' Club (a monthly?Bridge World?feature), declarer-play problems fit for "Test Your Play" (another?Bridge World feature) or problems to challenge defensive maven Eddie Kantar. Instead you will find the kinds of "bread and butter" problems that arise several times a session each time you trudge to your local duplicate bridge club or travel to a sectional or regional tournament. An invaluable collection of advice for the improving player, covering all aspects of the game. Adam Parrish's entertaining and educational book, Bridge at the Cranmer Club, tells the story of a night at the local bridge club. Up-and-comer Aaron is playing with Tony, one of the top players in the club. The colorful characters who come to their table each round are perhaps even more interesting than the hands they play. Available as eBook for $9.99, or as paperback for $15.00. In this quiz book, British author Julian Pottage has compiled a set of challenges that will test the reader's ability both as declarer and on defense. The hands are organized by theme, so readers are able to concentrate on a particular aspect of card-play if they wish. Card Play Technique or The Art of Being Lucky 2nd ed. 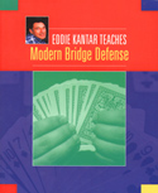 This is an excellent intermediate bridge book on card play. The original edition was published back in 1955, and was out of print for quite some time. Card Play Technique or the Art of Being Lucky is now back and updated in this 2nd Edition of a classic. The new version also includes a foreword by Nico Gardener's daughter Nicola Smith. 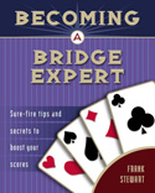 The superstar of bridge humor Victor Mollo teams up with Nico Gardener to provide the reader with an entertaining and informative book on card play. An intermediate-level discussion of declarer play, this book focuses on the power of the trump suit. Its subjects include trump timing - should you draw all the defenders' trumps straight away, some of their trumps, or perhaps perform some other vital task first? - and situations where you need to unblock in the trump suit or to put a defender on lead with a trump. The reader will learn how to make maximum use of the entries provided by the trump suit, and how to perform a trump safety play or a trump avoidance play. Two other important topics are how to make your contract against a bad trump break and how you can survive a forcing attack on the long-trump holding. Later chapters explain how to play contracts with fewer than eight trumps at your disposal, and also how to conjure extra tricks from the trump suit. Every couple of chapters or so, there is a 9-problem quiz section. Perhaps more points are won and lost on the opening lead than at any other time in a bridge hand. With only the bidding and his own thirteen cards as guidance, the opening leader must make a decision that has the potential, at one stroke, to determine the outcome of the play for better or worse. In this book, a top player and writer takes the reader through the questions that need to be asked before selecting an opening lead: whether to be active or passive, whether to lead partner's suit or your own, whether to lead trumps or not, whether to try a deceptive lead, and so on. These and many other issues are covered in an approachable book aimed at the player who wants to improve a key aspect of his game. 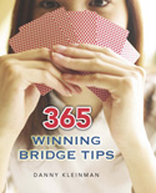 This is not a book for players who win regularly at their local bridge club - it is for those who don't, but would like to. The author does not claim to be a top-level expert, and admits that he made many mistakes on his way to earning the coveted title of Life Master. This book is intended to help others avoid those same mistakes and to learn from those that they do make. Written in a conversational, non-technical style, this is a book that will help any intermediate player become a better bidder, a better declarer, a better defender, and a better partner - the recipe for becoming a winner. Selecting the best line of play in a bridge hand as declarer is not easy. Most novices know something about basic odds and percentages, and can often find a line that offers a reasonable chance of success. However, the expert will skilfully combine options, so as to take advantage of more than chance. Rather than putting all his eggs in one basket, he will 'stay alive', squeezing out every extra chance. In this book of intermediate problems, Kantar shows the reader how to do this -- there is always a line of play that will allow you take all your chances, and bring home your contract. Bridge Today Digest?recently celebrated its first anniversary (and 100th issue) as an Internet-based "bridge-zine". It is renowned for its practical advice, its wonderful bridge stories, and the wry humor and personal touch of its editors. For this collection, they have selected the very best pieces from their first year, and have come up with a compendium that every bridge player can read, enjoy, and learn from. It includes short pieces from world-renowned writers, questions and comments from readers (and the editors' responses to them! ), and a wealth of deals, anecdotes and advice from the editors. A great holiday gift. Bobby Fischer, the reclusive chess champion, once said: "You have found a good move - fine - now look for a better one." The same advice holds true in bridge. If you settle for second best, you will not achieve your full potential. Through a series of problems that are both fresh and a genuine test of skill, the reader is offered the chance to become accustomed to looking for that extra edge. Whether or not he finds the best answers first time round, he will surely develop new ways of thinking to strengthen his game. This book was originally published in 1994, and in this new edition are substantially revised and expanded. An over-the-shoulder look at the thought processes of one of the world's best players as Jeff Meckstroth takes the reader through the highs and lows of winning the Bermuda Bowl - the world teams championship. Written in the style of Terence Reese's classic Play Bridge with Reese, this book gives readers a chance to make their own decisions at critical stages in each deal, and compare their solutions with the authors. The narrative does not follow any specific world championship event, but all the deals are ones that Meckstroth actually played in Bermuda Bowl competition.